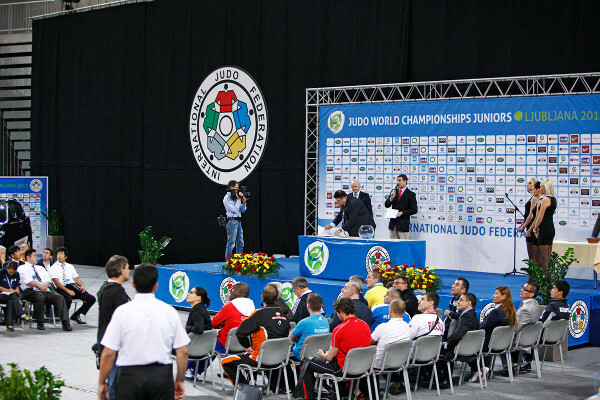 The Junior World Championships, Ljubljana 2013 continued with a spectacular day of judo at the Stozice Centre on Saturday. Four weight categories were in action on the last day of the individual competition as the junior women’s -78kg, +78kg categories and the men’s -100kg and +100kg categories all graced the tatami. The next generation of heavyweight stars delivered a day to day to savour as they powered up to fight towards world honours. The must-see team event brings the Junior World Championships to a captivating close on Sunday. Five judoka will compete in each team as the team format makes its inaugural appearance at the showpiece event for juniors. The team draw took place ahead of Saturday’s final block as Mr. Daniel LASCAU, IJF Sports Director, and Mr. Vladimir BARTA, IJF Head Sports Director presided over the draw along with Mr. Michal VACHUN, EJU Vice President. 16 teams will contest the men’s competition with a first round contest between Russia and Georgia – a repeat of the 2013 senior final in Rio – being the pick of the first round contests. 15 teams will take part in the women’s competition with Germany receiving a first round bye. They will meet the winners of the first round clash between hosts Slovenia and Mexico. There was also a special presentation as Mr. Jean-Luc ROUGE, IJF General Secretary, awarded a posthumous 7th Dan for Stanko TOPOLCNIK who passed away in April. Judo trailblazer Topolcnik was the first Slovenian judoka to win a medal at the European Championships when he won bronze in 1969. 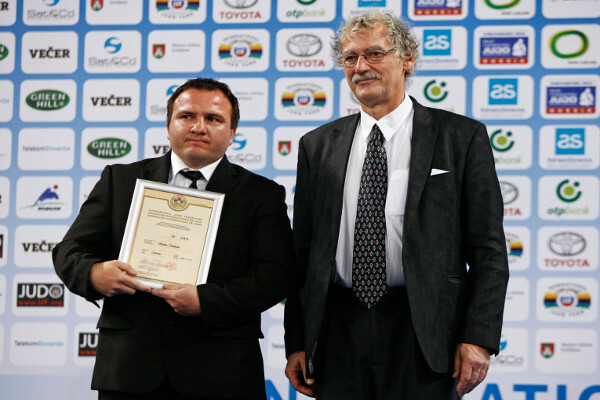 The award was accepted by his son Mr. Tomas TOPOLCNIK. The Junior World Championships individual competition will be fondly remembered for its competitiveness and sheer quality. 25 countries won medals across the individual competition with 16 gold medals shared by 12 countries. The spread of medals is in stark contrast to the last Junior World Championships in 2011 when Japan alone won 12 gold medals in Cape Town. Former Junior Belgian Open winner YOSHIMURA Shiori (JPN) was in a class of her own in the -78kg category and won the world title by besting St Petersburg Junior European Cup bronze medallist Samanta SOARES (BRA) in the final. YOSHIMURA was in a rush to add to Japan’s medal haul as she opened her day with a win in 38 seconds and completed it by dismissing the 2012 Rio Grand Slam silver medallist SOARES by ippon after 84 seconds. The Japanese teen sealed a place in the final by defeating Junior European Championship silver medallist Samah Hawa CAMARA (FRA) with a mune-gatame pin for ippon. At the same stage 17-year-old SOARES secured a hard-fought win against Ana Laura PORTUONDO ISASI (CAN) on shido penalties with one against the Brazilian and three against her opponent. Ahead of the bronze medal contests French teammates CAMARA and FISU Universiade silver medallist Madeleine MALONGA gave each other a high five as they stood matside next to each other waiting to be invited onto the tatami. The teammates experienced mixed fortunes as the first bronze medal was won by Cadet World Championship bronze medallist Brigita MATIC (CRO) who conquered beaten semi-finalist CAMARA by ippon after 72 seconds. MATIC saw her older sister Barbara win gold on Friday as the sisters won two of Croatia’s three medals. The second bronze medal was captured by 2013 Junior European champion Madeleine MALONGA (FRA) who triumphed against PORTUONDO ISASI. 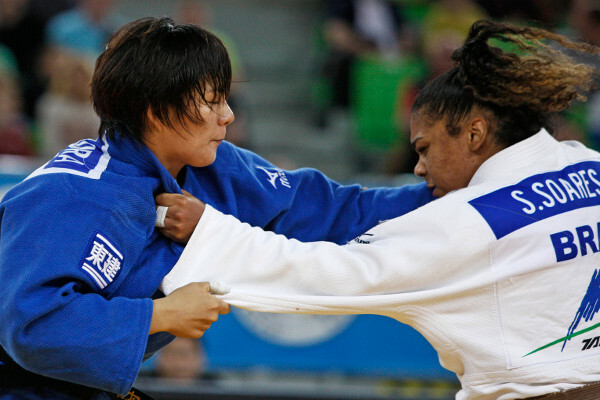 The powerful Frenchwoman threw for a waza-ari and won by ippon from a ko-soto-gake. Belgian Open bronze medallist INAMORI Nami (JPN) matched the efforts of her lighter teammate YOSHIMURA to move Japan to the top of the medal table. 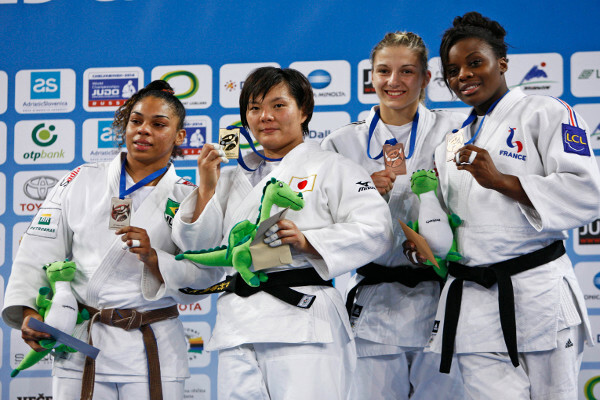 INAMORI won all five of her contests by ippon including the final as World Military Championships bronze medallist Carolin WEISS (GER) lost her second successive Junior World Championships final. INAMORI held down WEISS with a mune-gatame for ippon with two seconds remaining. The German hotshot had won her semi-final against Cadet World Championship winner Gusmary GARCIA SAVIGNE (CUB) with the same piece of osaekomi-waza while Japan’s latest champion pulled through against Junior South American Championships winner Sibilla FACCHOLLI (BRA) by ippon in 69 seconds. The first bronze medal was captured by FACCHOLLI who saw off 18-year-old Croatian u23 Championship winner Ivana SUTALO (CRO) on shido penalties. The second bronze medal was won by Junior European Championships bronze medallist Clarissa TAUBE (GER) who needed just 62 seconds to trap GARCIA SAVIGNE with a kami-sankaku-gatame for ippon. Canadian Championships winner Kyle REYES (CAN) emerged under the radar to win the -100kg title with victory over former Prague Junior European Cup bronze medallist KIM Leehyun (KOR). Tokyo-based REYES was one of the star performers as he reeled off four wins by ippon from five contests. With a minute remaining in the final, REYES struck with an emphatic tai-otoshi for ippon. Mr. Mike TAMURA, Canadian Judo Federation President was in the stands and, before presenting the gold medal to REYES, said: “Kyle did great, he is living in Tokyo and has done well in competitions in Japan so we always thought he could come through today. This is our future and the team is delighted.” REYES, who finished fifth at the Tokyo Grand Slam last year, made a statement of intent in the semi-final by defeating Cadet World Championship silver medallist Toma NIKIFOROV (BEL). The Canadian won with a waza-ari from an uchi-mata as the much-fancied NIKIFOROV slipped to the repechage. 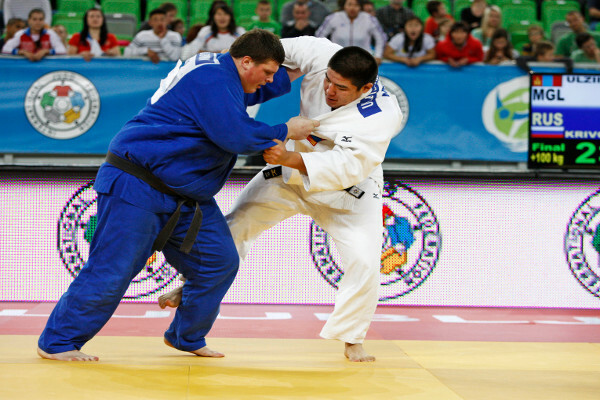 The second semi-final saw KIM Leehyun best 18-year-old Slobodan DORDA (BIH) win by ippon at the halfway mark. The first bronze medal was won by former Junior Asian Championships bronze medallist OGAWA Ryuko (JPN) as DORDA lost focus and received four shido penalties and therefore hansoku-make. 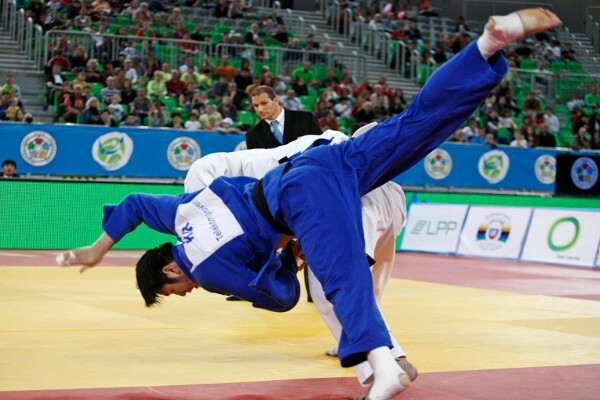 The second bronze medal was clinched by NIKIFOROV who launched Liberec Junior European Cup bronze medallist Aibek SERIKBAYEV (KAZ)) into the air with a hulking ura-nage for ippon after 33 seconds. 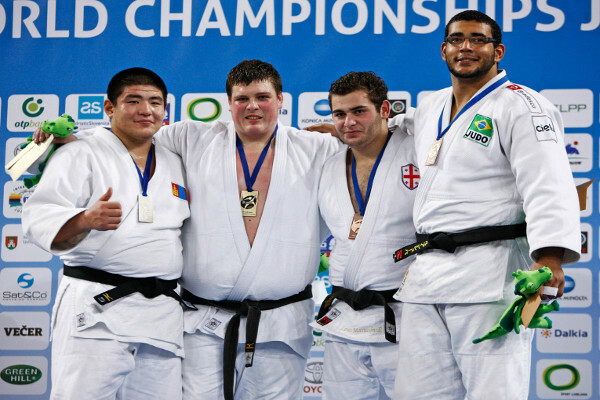 Junior European champion Anton KRIVOBOKOV (RUS) earned gold medal number three for Russia as he overpowered Duurenbayar ULZIIBAYAR (MGL) in the +100kg final. KRIVOBOKOV, a former Junior World Championship bronze medallist and Cadet World champion, won the title with a waza-ari score as Ulaanbaatar Grand Prix bronze medallist ULZIIBAYAR ran out of energy at the final hurdle. The Russian defeated Baku Grand Slam bronze medallist Levani MATIASHVILI (GEO) in the semi-final with a kesa-gatame while ULZIIBAYAR saw off Coimbra Junior European Cup winner Ruan SILVA (BRA) by ippon at the same stage. 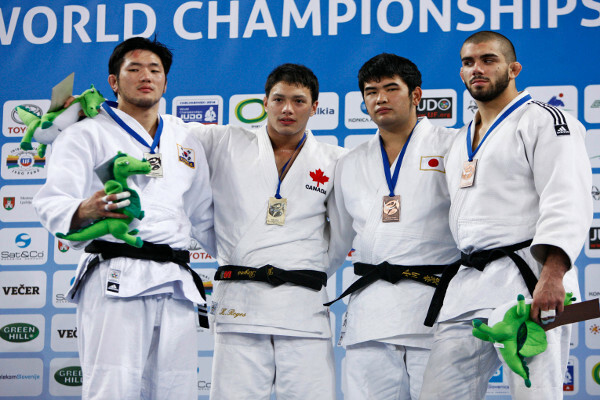 The first bronze medal was won by MATIASHVILI who defeated KURAHASHI Isao (JPN) by a waza-ari. The second bronze medal was clinched by SILVA who stopped Georgia’s hopes of a second +100kg medallist as ZAKARIADZE lost out by ippon with just two seconds remaining.